"Kelsey London knew a two-hour talk about government would likely be heavy educational material for her two young daughters. The Franklin family was at the first event in a planned discussion series in town, meant to help residents understand and become involved in government. The forum drew about 20 people. Local and state officials explained how government works, from the simple – the difference between a senator and a representative – to the complex – how Franklin officials decide the town budget." The article on School Choice which Milford Daily News ran on Jan 20, 2018 has been re-posted with an interactive table. 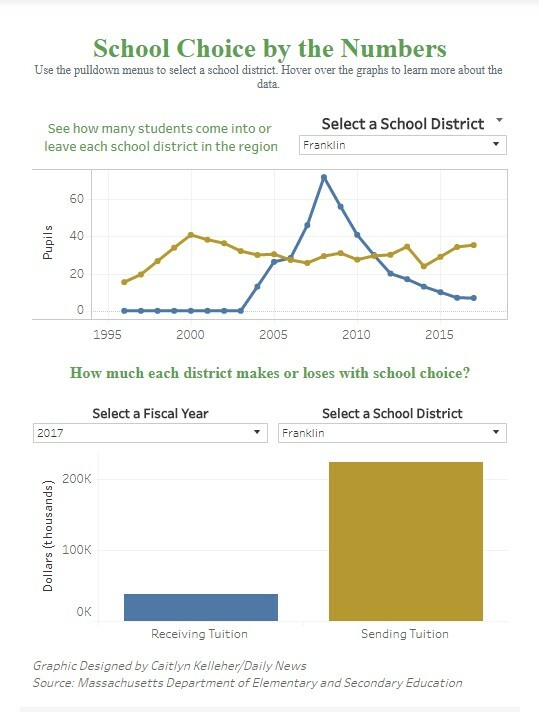 The table depicts two graphs: one of the sending and receiving students for a school district, and two, the sending and receiving funds for the school district.